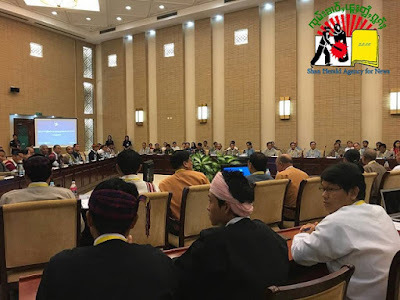 The right of secession from the Union of Myanmar and the drafting of constitutions for individual states and regions were the stumbling blocks at the second round of the Union Peace Conference, or 21st Century Panglong Conference (21CPC) as it has been unofficially dubbed. The talks in Burma’s capital Naypyidaw, hosted by State Counsellor Aung San Suu Kyi, broke up yesterday – after being extended for an extra day – with no breakthrough on the deadlock. Also speaking to reporters on Sunday, Khun Myint Tun, the president of Shan State-based EAO the Pa-O National Liberation Organization (PNLO), said, “A political discussion on the wording of ‘no-secession from the union’ dominated this morning’s session. Obviously, there is a need to seek a neutral terminology that is acceptable to everyone. However, according to Zaw Htay, a representative of the government’s Peace Commission (PC) negotiating team, it would be inappropriate to put a highly controversial subject such as the right of secession on the negotiation table at this time. He noted that, at the UPDJC Secretariat meeting, only 12 of the 21 points for debate had been agreed to date. A right to secede from the Union of Burma was written into the original Panglong Agreement in 1947 between Suu Kyi’s father, Gen. Aung San, who was representing a future Burmese government, and ethnic leaders.